Do you hate laws? Mostly I’m talking about the laws of gravity, but you can lump any pesky rules you want in there. Lucky for you, criminal scum, LawBreakers is offering a free weekend this week, giving you an opportunity to destroy even the most fundamental laws of physics. Dig into the best FPS games on PC. The free weekend begins September 28 at 10:00 PDT / 13:00 EDT / 17:00 GMT / 18:00 CET, or September 29 at 3:00 AEDT. It’ll run through October 2, and until October 4 you can grab the game at a 25% discount. LawBreakers has been in the headlines a lot lately, but mostly for bad reasons. Despite a largely positive response, the game has struggled to keep up its player counts, with peak concurrents on any given day rarely making it far past 200. Cliff Bleszinski and the team at Boss Key have emphasized again and again that they intend to stick with the game and make it success. That’s partly the realm of free updates, and partly up to events like this free weekend. 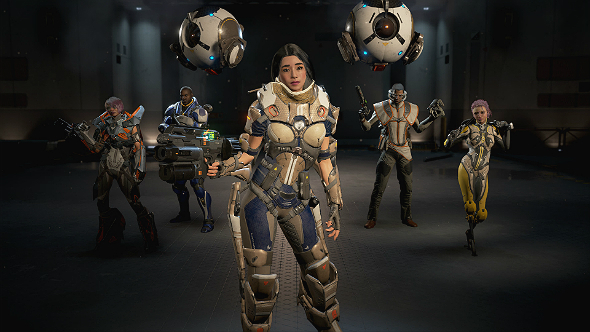 We’re pretty keen on LawBreakers, and there are several reasons to dig into the free weekend. Hopefully the game is making the right adjustments to hang onto its new players.